CAIRO — Yemen’s warring parties have agreed to a cease-fire in the crucial port city of Hudaydah, the United Nations chief said on Thursday, announcing the biggest step toward peace in years for a war that has produced the world’s worst humanitarian crisis. The Saudi-led coalition and Houthi rebels have agreed to withdraw their forces from Hudaydah, the main conduit for humanitarian aid entering Yemen, and to implement a cease-fire in the surrounding province, Secretary General António Guterres told reporters. He made the announcement in Rimbo, Sweden, at the end of a week of negotiations intended to pave the way for full peace talks. Amid smiles and handshakes, representatives from the two sides also agreed to a prisoner exchange involving as many as 15,000 people, and to allow a humanitarian corridor into the city of Taiz, Yemen’s third-largest city. They agreed to meet again in January. The terms of the deal announced by Mr. Guterres were vague in places, with talk of a “mutual redeployment” to stop the fighting in Hudaydah, and a “leading role” for the United Nations in the city. The United Nations is due to oversee the withdrawal of all combatants from the city within 21 days, but there was little detail about how that will happen. Both the Houthis and the Saudi-led coalition stressed that the cease-fire agreement signed Thursday was not a comprehensive peace deal, but purely a humanitarian gesture aimed at building good will. “Neither side sees it as the beginning of the end of the conflict,” Mr. Salisbury said in an interview. Even so, Thursday’s agreement marks a shift in the broader war. 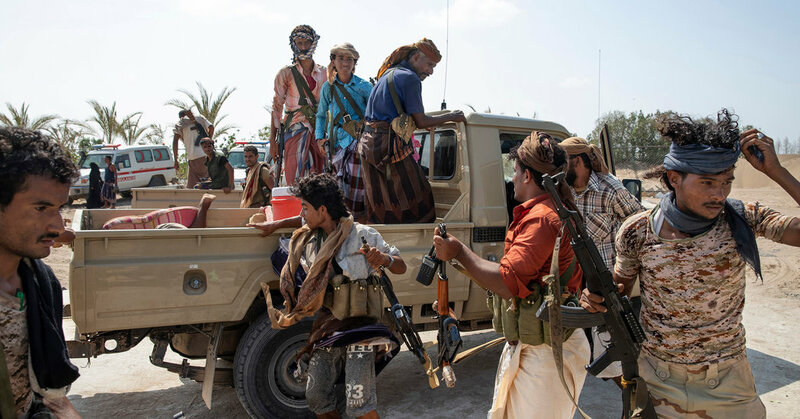 In the past month, the United Arab Emirates, part of the Saudi coalition, has led a fierce drive to seize Hudaydah, with its warplanes supporting allied Yemeni forces on the ground. They have almost entirely surrounded the city, with the Houthis controlling just one road leading out of it. Now, those hard-won gains will have to be surrendered if, as the deal stipulates, Hudaydah is effectively taken out of the fight. The international sense of urgency over Yemen has been driven by warnings that the humanitarian crisis could soon turn into a catastrophe. Aid groups say that tens of thousands of children have already starved to death in Yemen because of the war, and that 12 million people are at risk of starvation if the fighting does not stop immediately. A child dies every 10 minutes in Yemen from preventable causes, according to Unicef. Intense scrutiny of Saudi actions since the killing of the dissident Jamal Khashoggi has increased pressure on the Saudi-led coalition to come to talks and raised hopes for a peace agreement. In Washington, the Senate voted resoundingly on Thursday afternoon to withdraw American military assistance for Saudi Arabia’s war in Yemen. The House, however, earlier this week moved to scuttle the measure, all but assuring it will expire this year without making it to President Trump’s desk, who would likely veto it anyway. The fighting in Yemen started when Houthis seized power in the chaos that engulfed the country after the Arab Spring in 2011. But the war has since developed into a proxy conflict of sorts with Saudi Arabia and the United Arab Emirates supporting the government, and Iran backing the Houthis, who belong to an offshoot of Shiite Islam known as Zaydism. The last talks between Yemen’s warring sides took place in 2016. In the talks in Sweden this week, United Nations officials tried and failed to get both sides to sign on to a framework peace plan. Officials also had aimed to broker a deal to reopen the international airport in the capital, Sana, which has been subject of a Saudi blockade since 2015, but could not reach an agreement on that issue, either. But they were able to strike a deal that may ease the suffering in Hudaydah. In the Yemeni port, where artillery guns boomed across the city Wednesday night, residents were cautious in their welcome to news of the deal. “I just hope some life returns to the city so we can live peacefully, at least for a little while,” said Ahmed Jerwan, who works in a computer company. Muneer Shura’ee, a professor of English literature at Hudaydah University, was more skeptical. “I don’t think this cease-fire will last,” he said. Still, the deal signed Thursday exceeded expectations. At the start of the talks, United Nations officials were unsure if the two sides would even meet in person, and artillery and warplanes were striking Hudaydah, the focus of the Yemen fighting. Houthi fighters dug trenches across roads, apparently in preparation for a bigger battle for the city. But on Thursday, beaming representatives for the Saudi-backed government, which is based in the southern city of Aden, and the Houthis shook hands in front of Mr. Guterres. The focus turns next to the United Nations Security Council. Britain, which directs discussions about Yemen, will decide whether to introduce a resolution to reinforce the deal signed in Sweden. But the key is what happens on the ground in Yemen in the coming weeks, as United Nations officials oversee the planned withdrawal from Hudaydah.